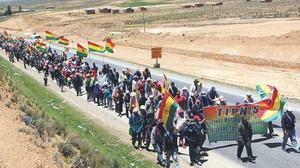 Bolivia’s controversy over the recently-cancelled TIPNIS highway intensified this week, as the CONISUR counter-march arrived to La Paz. The Movement Towards Socialism (MAS) government renewed its campaign for a formal consulta process to redetermine the fate of the road, fanning the flames of popular discontent and conflict between indigenous sectors. Bolivia’s conflict over the recently-cancelled highway through the TIPNIS National Park and Indigenous Territory intensified this week, as the CONISUR counter-march arrived to La Paz and the Movement Towards Socialism (MAS) government renewed its campaign for a formal consulta process to redetermine the fate of the road, fanning the flames of popular discontent. An estimated 1,000 pro-road indigenous marchers from CONISUR-affiliated communities—primarily in the southern section of the park-reached La Paz on January 30, after a 42-day trek from Isinuta (in the Chapare region of Cochabamba). Several thousand campesinos, cocaleros, and other pro-MAS sectors swelled their ranks in El Alto, where the MAS mayor welcomed the marchers as “illustrious guests” of the city before their final descent into the capital. CONISUR march approaching La Paz. Credit: La Razón. While the government daily Cambio reported that La Paz residents received the march with “solidarity,” most accounts characterized the popular response as “indifferent”—in marked contrast to the huge outpouring of civic support that greeted the indigenous march against the TIPNIS highway last October. 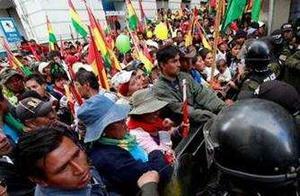 As political analyst Iván Arias Durán comments, while the original marchers’ principled defense of environmental and territorial rights resonated widely with Bolivians—and with international observers—the counter-marchers’ demands, though legitimate, are largely perceived as advancing sectoral interests. “It’s the first indigenous mobilization in favor of destroying their own territory,” he notes. Also, the CONISUR marchers, who are strongly supported by the MAS government, are not perceived as needing popular protection—in contrast to the original TIPNIS marchers, who were brutally beaten by police weeks before their arrival in La Paz. After a scuffle with police barring their entry to the Plaza Murillo, in which 20 officers and four reporters were injured, CONISUR leaders met with Morales to press their demand to repeal the law he signed last October declaring the TIPNIS reserve “untouchable.” The law is invalid, they argue, because the CONISUR communities were not consulted, and will be adversely affected by resulting restrictions on commercial and development activity within the zone. Further, they perceive the road as key to bringing schools, health clinics, and economic opportunities to their impoverished communities. CONISUR marchers clash with police. Credit: Página Siete.According to Gumercindo Pradel of CONISUR, the 37 communities participating in the counter-march are the “true indigenous residents” of the TIPNIS. In contrast, he maintains, the anti-highway march sponsored by the TIPNIS Subcentral and the lowlands indigenous federation CIDOB was instigated by NGOs with suspect affiliations and traitorous leaders out of touch with their base constituencies. In response, Fernando Vargas, leader of the TIPNIS Subcentral, notes that only eight of the 37 communities participating in the counter-march are part of the TIPNIS indigenous territory and collective land title (the others are located inside the “red line” area dominated by legal coca farmers within the park, or outside the park entirely). The counter-march, says Vargas, has been fomented largely by the MAS government, which has exploited the “untouchability” issue to stir up discontent in an effort to undermine the law. (A proposed regulation defining “untouchability” that was negotiated between the TIPNIS Subcentral and MAS government officials has been on hold since last December.) The delivery of education, health services, and infrastructure, Vargas maintains, is the government’s legal responsibility with or without the road, but the road far from guarantees that these benefits will be provided. The provocative argument that the anti-highway protesters “forced” the government to cancel the road is a theme that has recently gained traction with Morales. In his “state of the union” address, he accused the pro-TIPNIS marchers of entering La Paz with the intent to overthrow his government, leaving him to a fate similar to that of former president Villarroel (who was dragged out of the presidential palace and hung from a lamppost by an angry mob in 1946). TIPNIS and CIDOB leaders categorically deny this allegation. 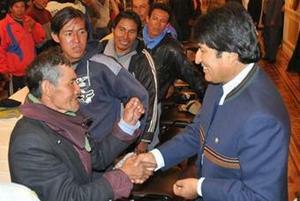 Morales meets with marchers. Credit: Página Siete. Within the MAS legislative leadership, three possible “solutions” to the crisis are under discussion. The first is to annul the law protecting the TIPNIS and cancelling the highway, as demanded by CONISUR. But with the recent formation of an “indigenous bloc” of legislators whose members have pledged to defend the TIPNIS law, the 2/3 vote required for annulment will be difficult to achieve. In addition, the repeal of the law could create a climate of uncertainty and call the government’s credibility into question. The third proposal, now billed as a “compromise” solution, is to convene a formal consulta among those affected by the proposed road. The government has recently prioritized the development of a general law implementing the consulta previa required by the Bolivian Constitution for projects that may adversely affect indigenous territories, which could be applied to the TIPNIS context. A pro-road vote would lend credence to a future modification of the TIPNIS law. The TIPNIS Subcentral and CIDOB have vigorously denounced this proposal as an effort to sabotage the existing law, and a violation of the government’s legal obligation to seek the “free, prior, and informed consent” of indigenous groups before signing agreements such as the construction contract and funding commitment for the TIPNIS road, which are still in force. Unless these contracts are cancelled first and the project is returned to “ground zero,” Vargas says, the TIPNIS Subcentral will boycott any consulta. Many other thorny issues will need to be addressed in developing a consulta process for the TIPNIS. These include the problem of who should be consulted—members of the indigenous territory only, as mandated by the Bolivian Constitution? Or also the indigenous CONISUR communities who are not part of the collective land title? Some MAS legislators advocate a referendum for all residents of the Cochabamba and Beni departments, straying even farther from the Constitutional framework. Whether or not the results of a consulta should be binding is another controversial issue. Chávez was also sharply criticized by Vargas, who questioned why the departmental government needs an accord with a popular organization to carry out its legally-mandated responsibilities. 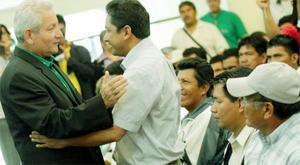 For his part, Chávez disclaimed any intent towards a political alliance, and defended the agreement as one of many he hopes to negotiate with other departments and municipalities. Whether or not this controversy portends a rift within the anti-highway forces, it has provided new fodder for those seeking to undermine their legitimacy. Further fanning the flames of popular discontent will not resolve the TIPNIS conflict any time soon, but may keep indigenous groups focused on their conflicts with each other instead of on their grievances with the MAS government, and on the structural causes of their common oppression. For more coverage, see Dario Kenner’s Bolivia Diary and Carwil Without Borders. Read more on the TIPNIS conflict on Emily Achtenberg's blog, Rebel Currents. See also, the January/February 2011 NACLA Report, "Golpistas! Coups and Democracy in the 21st Century;" the September/October 2010 NACLA Report, "After Recognition: Indigenous Peoples Confront Capitalism;" or the September/October 2009 NACLA Report, "Political Environments: Development, Dissent, and the New Extraction." Or subscribe to NACLA.